From old furniture to family photo albums, textbooks to toys, clients across the Redlands area have plenty of reasons to search for storage options. Finding a storage unit gives clients a wonderful gift: the ability to clear things out of their home and free up closet, basement, attic, or garage space for items that truly need to be at their fingertips. The professionals at Vines Storage know that our clients want a unit that is clean, weather protected, safe, and secure. Furthermore, they want flexible lease options and a space that is the right size to fit their needs. Vines Storage offers all these features and more with our amazing self-storage units. If you're considering a self-storage unit, here's what you need to know about Vines Storage. Convenience: Located at 1897 Colton Avenue in Redlands, our facility is easily accessed only three miles off Interstate 10 Freeway. Options: At Vines Storage, we know that it's important to have choices. Just like it is important enough to find a storage unit that will fit all of your belongings, you also don't want to pay for more space than you truly need. We offer small units that are only 5' x 5' and units as large as a two-car garage. Furthermore, we have indoor and outdoor spaces for your RV, boat, or car. With all of these choices, there's no need to go anywhere else for storage options. Easy Leasing: Storage shouldn't be a source of frustration for you. At Vines Storage, it's not. We make it easy and hassle free with flexible storage options. If your storage needs are temporary we can give you a short-term lease, while if you need the space for a long period of time, or if you're unsure how long you may need the unit, we can give you a longer-term lease contract. Safety: If your belongings aren't in your own home, it's important to know that they're safe and secure. The storage units at Vines Storage are climate controlled, keeping your items in great condition. Not only are your belongings protected from weather elements like extreme heat and cold, they're also safe from outdoor critters or rodents. In addition, our facility is key-locked and monitored by a host of cameras. 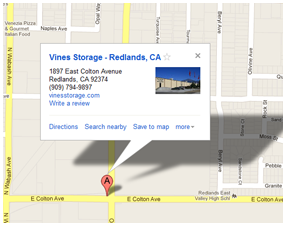 For more information about Vines Storage and our self-storage options, call or visit us today.